Flower of life tattoo is a beautiful and also meaningful tattoo. It usually consists of 19 intertwined small circles of the same size that form a bigger ring. Many philosophers and architects who researched the flower of life agree that this symbol has a perfect form. Also, many people believe that the flower of life is a non-human symbol. They relate it to the creation of the universe. Pretty quickly, the tattoo lovers find that the flower of life will also look impressive on the body. As it turned out – it is incredible. Let’s take a more in-depth look at this beautiful symbol. You can find this symbol in almost every culture and every part of the world. You have undoubtedly seen it somewhere else apart from the tattoos. It is a widespread symbol that appears a lot in the form of clothing or jewelry. Not so long ago, back in the 19th-20th century, people in some regions used to decorate the furniture with the flower of life symbol. However, besides being a beautiful ornament, it also has a profound meaning. The symbol of the flower of life dates back at least 6000 years which was found in the temple of Osiris in Egypt. There were inscriptions on the walls with the patterns of the tree of life – a perfect geometric shape. Another location is the Golden Temple in India where the archeologists found the 16th-century inscription of the flower of life. This symbol also appears under the Guardian lions in front of the imperial palace in Beijing. The flower of life also appears in Bulgaria, Hungary, and Austria. As well as in Mexico and Peru. It also appears in ancient Phoenician, Assyrian, Hindu, Middle East and European medieval art. In regions like Poland and Baltic countries, the ancient people used this symbol frequently in ceramics and jewelry. 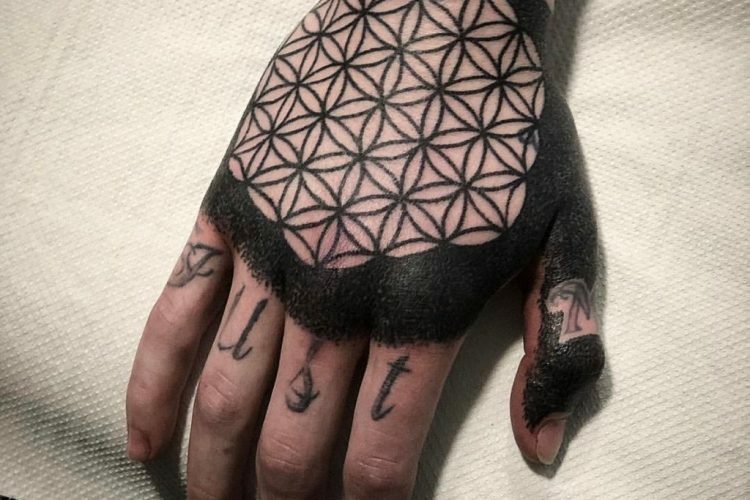 Flower of life tattoo – what does it mean? Generally, this symbol represents a divine map with which you can master the universal energies, even those that we don’t know yet. As for a tattoo, it may embody a symbol of eternity which connects with the universe. Many people believe that this geometric pattern has a strong symbolical and esoteric meaning. According to the specialists of this field, with the flower of life, you can connect with the other dimensions. This connection comes from a belief that this symbol appears not only on the earth but also on the other planets and the entire universe. Which basically means that the flower of life goes beyond our perception and reality. Another meaning of this symbol expresses the ability to see the path and the events of our life because every action that we do connects with the result and repeats over and over throughout the entire life. All in all, every person chooses the meaning depending on his personal beliefs. The flower of life is a beautiful and mystical symbol, so there are many reasons to put it on your body.